CHIPPEWA FALLS, Wis. -- There is unspeakable sadness in Chippewa Falls, Wisconsin. The community gathered Sunday night to remember four lives taken suddenly in a hit-and-run crash, reports CBS Minnesota. Three young Girl Scouts and a mother were killed Saturday while cleaning garbage out of a ditch in Lake Hallie, Wisconsin. Police said 21-year-old Colten Treu was driving a pick-up truck that left the road and hit the troop. He took off but later turned himself in. A fourth girl was battling critical injuries. Lake Hallie police Sgt. Daniel Sokup told The Associated Press Treu will be charged with four counts of homicide. According to The Star Tribune, the crash happened before a hill and there were no blind spots. Sokup said it wasn't "an unsafe area." But Cecily Spallees, a personal care attendant at a group home near the crash site, said drivers often go too fast there. The speed limit changes quickly from a 55-mph to a 35-mph zone. "I'm always telling one of my residents that he shouldn't walk this strip at night," Spallees told the newspaper. "It's not safe." It wasn't clear whether Treu somehow got distracted, Sokup said. Girl Scouts of the USA CEO Sylvia Acevedo issued a statement saying, "Our hearts are broken for the girls and families of the Girl Scouts of the Northwestern Great Lakes. We ask for privacy for the council, and for the families who are mourning the tragic loss of loved ones today. The Girl Scout Movement everywhere stands with our sister Girl Scouts in Wisconsin to grieve and comfort one another in the wake of this terrible tragedy." 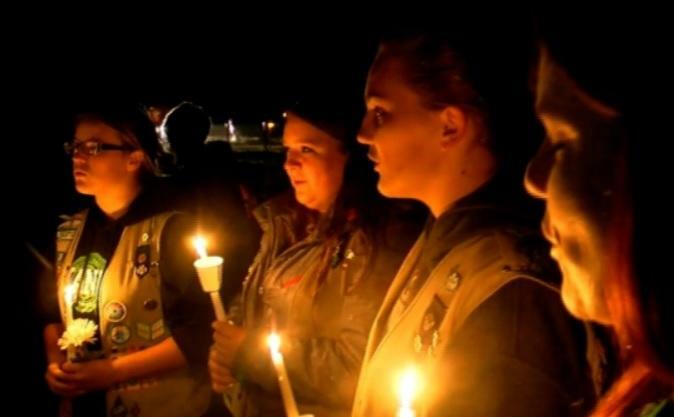 On Sunday night, in the rain and with candles in hand, Girl Scouts sang songs of sadness. "It's just devastating. It hits me especially hard since I have two children of my own," Chippewa Falls resident Jill Schafer told CBS Minnesota. Schafer was one of hundreds who gathered for a vigil outside Halmstad Elementary School in Chippewa Falls to pray for the vitcims. "I have one son here that's in Scouts and he's wearing his Scout uniform to help represent the scouting community," Schafer said. Investigators said the Girl Scouts, mostly fourth graders and parent volunteers, were cleaning trash along a county road when the pickup Treu was driving veered into the ditch, hitting several of them before driving off. Two girls and a parent died at the scene. A third girl died at a hospital. "I was in tears this morning. I will be weeping often this morning, I know that," Pastor Jim Woldhuis said. "Just a fun-loving girl, Girl Scout. Just your typical little fourth grade girl skipping through life," Woldhuis observed. And her mother "had faith, she had purpose and invested herself in her children," Woldhuis added. Lake Hallie Police were also expected to release the victims' names.